For centuries, the Theatre has always been a form of art and entertainment that closely mirrors the experiences of being human. Whether evoking tears or laughter, the Theatre never fails to touch the hearts of its audiences. But more than this, in recent times the Theatre also serves as an instrument that aid many charitable institutions, who in turn change lives for the better. It is our great pleasure to invite you to become part of a Theatre dedicated to such a noble purpose. Due to the success of its hilarious first run, Defending the Caveman, Broadway’s longest-running one-man comedy about the sexes, returns on the Philippine stage to offer audiences more laughs. The show, starring local theater veteran actor Joel Trinidad and directed by Michael Williams and Cathy Azanza-Dy, will be restaged by CTE Productions and Theater Mogul at the Carlos P. Romulo Auditorium, RCBC Plaza in Makati, on May 14, 15, and 16. Part of the proceeds of the ticket sales on May 15 and 16 will go to the Carewell (Cancer Resource and Wellness) Community (http://www.carewellcommunity.org/) which provides support, education, and most importantly, hope at no cost to persons with cancer and their loved ones. As such, we would like to offer you the opportunity to participate in this worthwhile cause by buying a ticket to watch the show or sponsoring a cancer patient to watch the show. "This play can save marriages... I'm not kidding!" These are just some of the comments overheard during Valentine's weekend at the Insular Life Theater in Alabang, where audiences had just seen local theater veteran Joel Trinidad perform in Defending the Caveman, the longest-running one-man comedy show in Broadway history, which has sold over 8 million tickets worldwide in 16 different languages. On its Philippine premiere, the show - with its hilariously true insights on the differences between men and women - was greeted with uncontrollable laughter, knowing nods of agreement, and a resounding standing ovation! 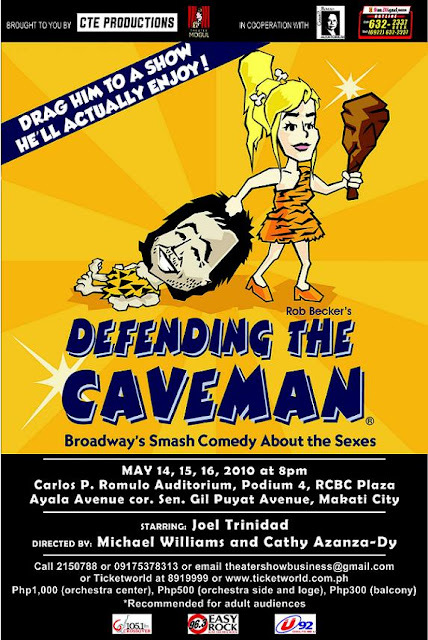 And now, to satisfy the countless requests for a repeat engagement, Defending the Caveman returns on May 14, 15, and 16, this time at the Carlos P. Romulo Auditorium, Podium 4, RCBC Plaza in Makati. The re-run of Defending the Caveman is brought to you by CTE Productions and Theater Mogul in cooperation with the San Miguel 632-BEER(2337) Home Delivery Service. Tickets are available at Ticketworld. Call (632) 8919999 or log on to their website at www.ticketworld.com.ph. You may also text +63.917.5378313, call (632) 2150788, or email theatershowbusiness@gmail.com to order tickets. This could be a perfect gift for Mother's Day, which will fall on May 9. Join DEFENDING THE CAVEMAN PHILIPPINES on FACEBOOK for more updates!